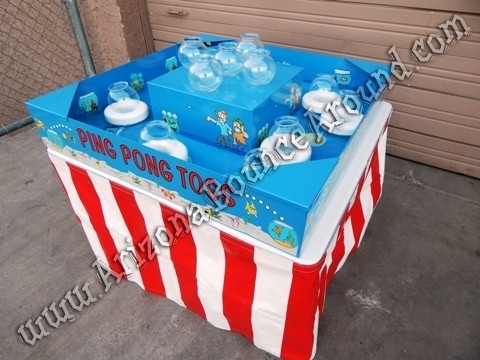 Our Ping Pong Fish bowl game features 4 fish bowls on the top level and 6 floating fish bowls that move like a duck pond making this a real challenging carnival game for parties and events. This classic carnival game will be a big hit for all ages including adults. This game comes complete with 3 ping pong balls and a short table with red and white striped carnival skirt ready for use. 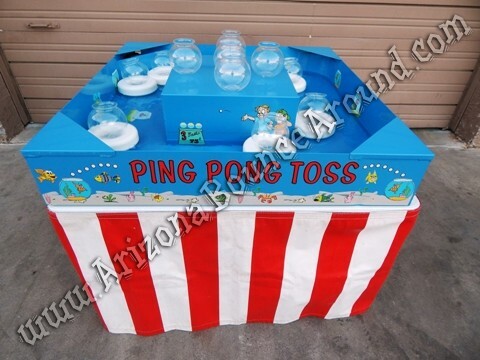 We also have a fish pond carnival game so be sure to check it out. It does require electricity and 5 gallons of water that are not included or supplied in the rental price. 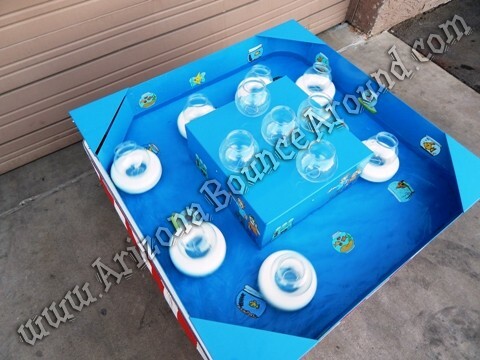 This game can also be played on the ground if you wish or add one of our carnival game booths to make your carnival games come to life. The water moves pretty quickly making this a real challenging game perfect for prizes or fund raising. Gravity Play Events is a carnival game super store serving all of Colorado with amazing carnival games and activities since 2002 so call one of our carnival event planners today to get the party started 719-531-7510.